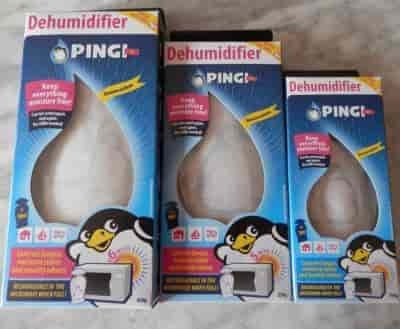 Adelaide Dehumidifiers - control moisture & mould. Adelaide Dehumidifiers for winter mould control. Adelaide is generally not considered to be very humid. However, the winters can be wet and quite cold. When you combine this kind of weather with areas with little air movement, mould incubation will follow. The connection between moisture and mould has discussed in more detail previously. Just click on the link and have a look. Outdoor activities like camping, boating or taking trips with a caravan are popular pastimes in summer, while the weather in South Australia is mostly dry. When the hiking gear,boat or caravan is stored over winter, Adelaide Dehumidifiers become an important moisture trap to guard against mould. Our Adelaide Dehumidifiers make also ideal bedroom dehumidifiers as they are non-electric. Our products consist of bags containing silica gel that absorb moisture. The bag has a blue moisture indicator that will gradually turn pink as it becomes saturated. Adelaide Dehumidifiers can be recharged in the sun or in a microwave. The latest batch of our PINGI range have been in use for more than 18 months. This makes our Adelaide Dehumidifiers very cheap dehumidifiers over time. Unlike other competitive products that require refilling, our products last for a long time and can be used many times. The Adelaide Dehumidifiers are sold online and postage plus handling is free. We only supply our products to the Australian market. Please have a look at how we approach our online customer service and sales. Click on the red link. Moisture traps to combat mould. Buy your Adelaide Dehumidifiers today! Our postage and handling is free. Click on shop to order. Have a look at our Moisture Absorber Specials page for great value! Just click on the red link. Some very handy hints on how to store contents from Store Ur Stuff. Our products contain Silica Gel pellets. More data on this ingredient can be found on Wikipedia. Clean water technology compliments indoor air quality. For world class advice and detail on water filtration and reverse osmosis products please click on Pacific Water Technology. Mould removal in itself is quite involved and possibly best left to the experts. Local mould removal companies like ChemDry could be a good choice. Professional knowledge is very important as domestic moisture and mould issues may be difficult to resolve. It is very important to try and avoid the spread of mould spores. Cleaning and decontamination of visible mould in your home would be the first step. Adelaide air conditioning cleaning will also help to decontaminate the coils and filters. Air conditioning systems are sometimes a significant part of spreading mould spores. Hi Alan, we only sell online, I am afraid. Every product price includes postage.